It's been well over a week since the first screening of The Day of the Doctor, so these pictures shouldn't prove to be spoilers to anyone by now. 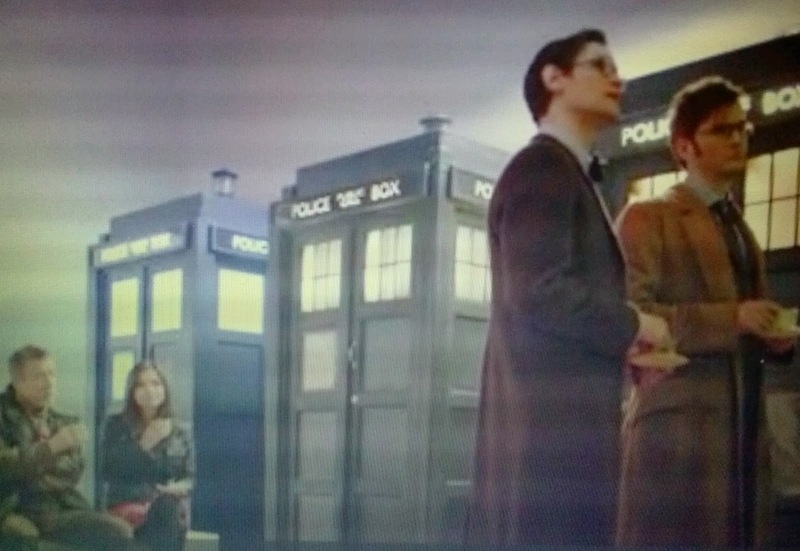 If ever - all we have here is all three Doctors and Clara stopping for some tea together. This is not an episode review; like I said before, I tend to leave that to other people while I concentrate on occasionally posting book or tea reviews here. I just thought I'd share one of my favorite parts of the episode. 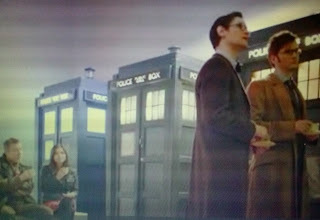 Actually, it kind of sums up what I love about the Doctor: save the day, then stop for a cuppa. It's what I would do! I mean, I'm a sucker for a scene in any show or film, or even book, where the characters share teatime together. It's relatable, although I suppose taking tea with my selves would be kind of odd. But this stuck out even more, because once again, the Doctor is the hero of the day using brains as the best weapon in his (their) arsenal, and then, without feeling girly or ironic at all, having tea in little pretty teacups. I've probably said this here in the past, but it kind of irks me that guys don't like to be seen doing what they think are frilly feminine things, particularly when it comes to the realm of tea. How is it unmanly to have tea in little china cups? Personally, I respect a man who can handle delicate items as well as screwdrivers. Sure, china tea cups are easily shattered, but they also present tea in probably the best way. I assert to the end that tea of all kinds taste better in china, just as wine is better from a glass. Breakfast teas are nice in mugs with milk, of course. Ice cream's good in everything, but that's another discussion. Perhaps I'm straying into metaphorical territory here, but let's just round it down to this. I have no problem going to a 'guy' spots, like, I don't know, a sports bar, for instance: I certainly don't think it makes me less feminine. What's so unmanly about taking tea? Is this just a problem in America? I don't like to talk about gender politics; it's not in my nature. I just like seeing a balance, and perhaps a curbing of the insecurity associated with 'being seen' doing things that males have done for centuries. I suppose, literally centuries for The Doctor. In the end, taking tea with someone, to me, means sharing life together, and being comfortable with your company. Hopefully that says it all. Just like a truly feminine woman can be delicate yet strong, a truly masculine man can be strong yet delicate.